This Rehabilitative Knee exercise is attributed to the famous Qi Gong and Xing Yi practitioner Dr. Ma Li Tang. It can be used to preserve the health of the knees or as a rehabilitative exercise for injured or arthritic knees. Sit upright on a chair, with the lower legs at a right angle to the thighs. 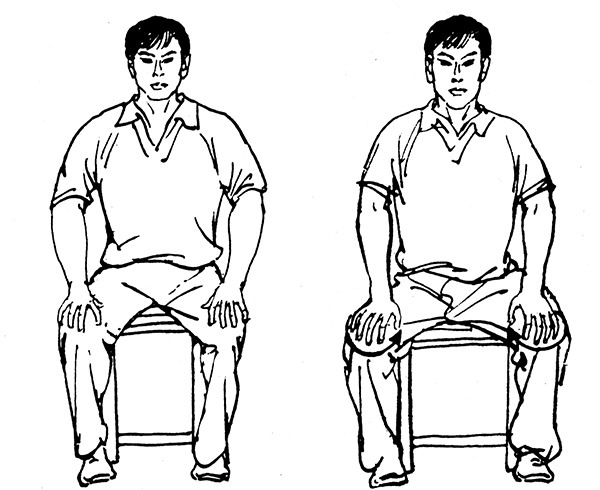 Your hands are on your knees with the palm centers (Laogong: P 8) on the kneecaps. Massage the knees outward, downward, inward and upward in circular movements until they feel warm. 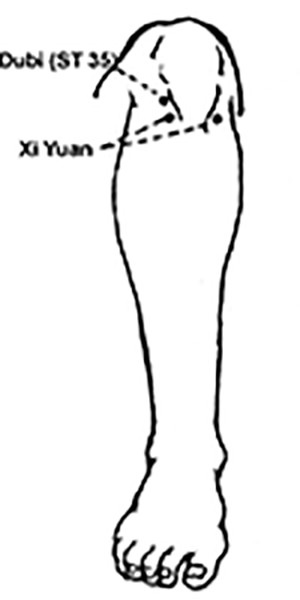 The index fingers and middle fingers the two hold the Xiyan (Extra Points) of each knee, and the ring fingers hold Dubi (ST 35). Massage the knees the knees outward, downward, inward and upward in a circular movement, Inhale during the first half of the circle (outward and downward) and exhale during the second half of the cycle (inward and upward). Apply pressure on the acu-points with the fingers as you inhale and relax the pressure as you exhale. Note: Make sure that the pressure on the points during inhalation is inward towards the center of the knee joint and not upward. Pause for a minute with the palm centers (Laogong: P 8) on the kneecaps as you direct warmth from you palms to the knees. Repeat Steps 2 and 3 at least 2 more times, or continue as many times as necessary, until a soothing warmth penetrates the knee joints. Ideally you will feel this warmth begin to travel down your lower leg. This exercise helps get rid of wind, cold and damp in the knees, and can help weak and swollen knees by increasing local circulation to the knee. In traditional Chinese medicine, these kinds of symptoms are called Bi Syndrome, which include arthritic type pain. This exercise also indirectly helps the Kidneys and Liver, because the Kidneys rule the knees and low back, and the Liver rules the tendons – the knees are considered to be the “house of tendons” in Chinese medicine.